Over the past couple of weeks, RiverFront’s tactical team reinvested the cash raised in risk management moves back in early February. The reinvestment was predicated on the output of the tactical team’s sentiment and momentum models, which indicated better than average probabilities for market gains in the next 3 months. RiverFront allocated part of those funds into emerging market (EM) equities. RiverFront is now overweight EM stocks relative to our baseline benchmarks across most of our asset allocation portfolios. For information on specific portfolio allocations, visit riverfrontig.com. One encouraging sign for EM equities, in our opinion, has been the message of the market itself. EM has displayed one of the most consistently positive technical pictures of any of the asset classes we track, in our view, despite concerns over the path of US interest rates and trade. For example, during the current period of heightened volatility, EM has performed relatively well and has thus far remained above its primary uptrend, as defined by its 200-day moving average. We think this is noteworthy given its history as one of the more volatile asset classes. 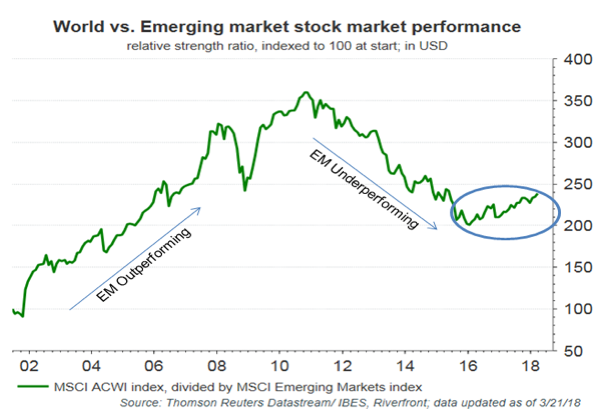 Additionally, relative strength trends of EM vs. world equities look to us to have put in an important multi-year bottom and have exhibited an encouraging pattern of higher highs and higher lows (see blue circle on chart). We think this bodes well for the asset class longer-term. This positive relative strength is a far cry from the ‘submerging markets’ theme that dominated from 2011-2016, when EM was an underperforming asset class. ‘Resurging Markets’ might be a better name for the economic and stock market strength since Chinese and global growth accelerated in mid-2016. 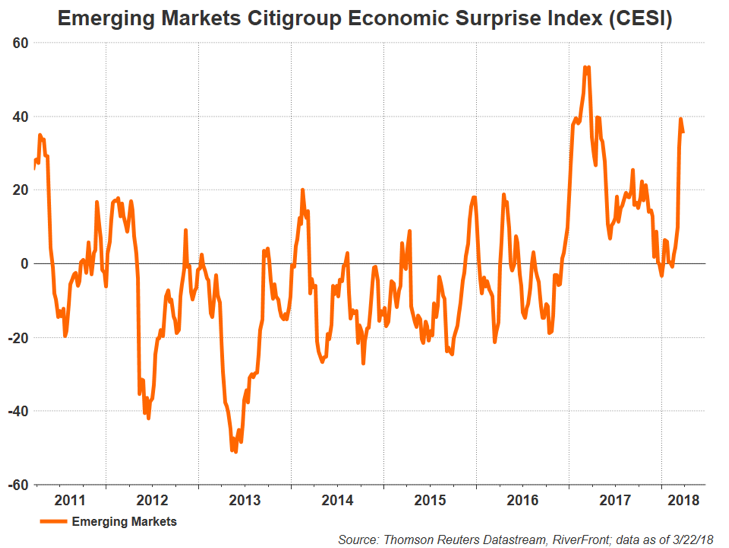 As shown in the chart on page 2, the trajectory of EM economies continues to be on an upswing, judging by the Citigroup Economic Surprise Index (CESI). Calculated daily, a positive reading on the emerging market CESI suggests that economic releases in the region have been on balance beating the consensus expectation from economists just prior to the release. As shown in the chart below, the trajectory of EM economies continues to be on an upswing, judging by the Citigroup Economic Surprise Index (CESI). Calculated daily, a positive reading on the emerging market CESI suggests that economic releases in the region have been on balance beating the consensus expectation from economists just prior to the release. A lot of this recent strength has to do with positive trends in China, the lynchpin of EM. China is not only the single largest weighting in EM indices (at ~30% of the MSCI EM index), but also the world’s second largest economy. It is also the economic celestial body that nearly everything else in EM revolves around; whether it’s the commodity-based economies of Latin America, Eastern Europe and Africa, or the China-focused manufacturing and exporting ecosystem of north and south-east Asia. From an earnings perspective, the MSCI Emerging Markets index is now expected to experience double digits earnings-per-share growth in both 2018 and 2019 (Source: I/B/E/S, Thomson Reuters Datastream). Encouragingly, the 2018 consensus number has improved almost 2 percentage points since the Fall, indicating that analysts in aggregate are growing more optimistic about earnings growth in EM going forward, even after its very strong 2017 performance. EM had a very rough week last week, dropping nearly 5% on concerns about an escalating ‘trade war’ between China and the US. First it was washing machines and solar cells; then it was steel and aluminum; last week it was Chinese technology. The Trump administration has been looking to make good on its campaign promises of getting tough on global trade, especially with China, and the stock market has been on the razor’s edge ever since. 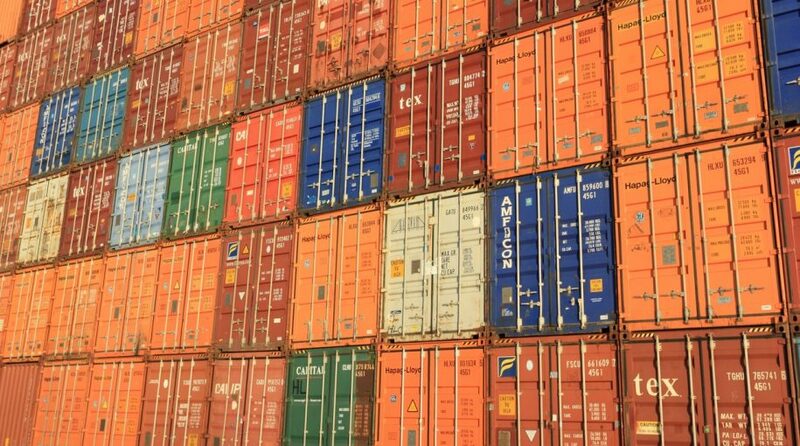 You can count us among those who believe that true trade wars are neither ‘good’ nor ‘easy to win’, and a major facet of our bear-case scenario in our 2018 Outlook dealt with trade friction that spills over into the real economy. However, we would encourage everyone to take a deep breath before declaring the end of the equity bull market due to trade concerns. To put the current trade discussion into perspective; the $50-60B of tariffs threatened last week against China amount to slightly more than a tenth of China’s total goods exports to the US (Source: Capital Economics). This is certainly enough to get China’s attention – and it did – but not big enough to set off a trade-induced global economic meltdown, in our opinion. Citigroup estimates that even a 45% tariff on $60B of Chinese goods would only lower China’s GDP by around a quarter of a percent, which is likely manageable in an economy growing well over 6%. One last point we feel compelled to make is that China deserves scrutiny for their trade practices and US trade relations with China are overdue for an overhaul, in our view. According to the US Trade Representative (USTR) report released on 3/22, China has engaged in unfair trading practices and exploitation of US intellectual property for years. Furthermore, in a recent Goldman Sachs report, China was singled out as a country that not only runs a large bilateral trade surplus with the US, but also enforces an asymmetric tariff system, where Chinese tariffs on US goods and services are significantly higher than US tariffs on Chinese goods and services. In contrast, other countries with large trade surpluses like Japan and Germany, apply tariffs on US goods and services that are mostly symmetric with US tariffs. Thus, the Administration’s threat of a trade war with China may be a logical and effective tool, albeit a nerve-wracking one for markets, to win fairer trade for US companies. A major part of our job as asset managers and strategists is to try and make sense out of times like these. We attempt to apply logic, reason, and the careful and disciplined study of the past, in order to try and infer what could happen in the future. However, these are volatile and fluid times, and we recognize that market sentiment can overwhelm even logical, rational views. We also recognize, with humility, that the market is the final arbiter of what view is ‘right’ or ‘wrong’. Thus, RiverFront employs a disciplined risk management process that can override our fundamental views, if the message of the market is unequivocally in opposition to them. Risk management helps us to be objective about our decisions in times of stress, and we believe it is a valuable part of our overall process.